Roger Grainger is the author of a number of books, including The Language of the Rite (Darton, Longman and Todd) and The Message of the Rite (Lutterworth); The Drama of the Rite (published by SAP in 2008) is the final book in this trilogy. Other publications include: Imagination, Identification and Catharsis in Theatre and Therapy (with Mary Duggan); The Social Symbolism of Grief and Mourning; and Theatre and Relationship in Shakespeare's Late Plays. The Drama of the Rite brings home the dramatic identity of ritual and the religious significance of all kinds of theatre. Historically speaking, religious ritual and theatre appear to have evolved together. But what is the relationship between catharsis and liturgy? How liturgical is theatre, and how theatrical is liturgy? Liturgy’s purpose is dramatic; like theatre it is a kinetic medium focusing upon the presence of the other person, whether divine or human. 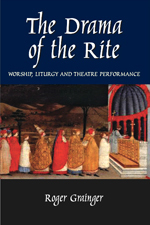 This book explores the characteristics of liturgical experience – concentration, single mindedness, intentionality, emotional catharsis and above all, the quality of encounter on which personal environment depends – an exploration which leads into the dramatic shape underlying both liturgy and theatre, that of the rite of passage itself. Examples are given of such rites, understood from the point of view of their theatrical nature and purpose. This involves looking at liturgical structure from a point of view which up to now has largely been neglected by scholars, although its relevance emerges with striking force, as the drama of the incursion of the divine into human lives. Many have spoken and written of the ‘drama of religious ritual’ and been content to leave it at that. Roger Grainger takes a cliché and examines the often misunderstood truth it expresses. This is a book of carefully distilled wisdom, valuable both for the student of liturgy and for the Christian, lay or ordained, seeking to understand the central role and enormous resourcefulness of liturgy for that constant conversion which is the life of faith. Having written about the language of the rite and its message, Grainger here completes his trilogy about Christian liturgy. He characterizes liturgy as an attempt by worshippers to suspend their philosophical and secular disbelief and encounter god. This attempt and this encounter are not individual however but communal, and the ritual must be shared to be effective. He discusses getting to the heart of things, rite and drama, ritual and symbol, liturgy and the shape of story, celebrating life, and liturgy and transformation. I imagine there are very few books which combine perspectives on liturgy from structural anthropology, narrative theory and continental philosophy and end up offering a memorial service for a dead cat. This, subtitled ‘worship, liturgy and theatre performance’, is one such book. Roger Grainger is convinced that good liturgy should be at the heart of the Church’s life, and a primary means by which the Church is caught up in God’s work of transformation. This insistence on transformation means that he approaches all liturgy as a rite of passage with an underlying deep narrative structure.